Bright lights, screeching tyres and fuel fumes. 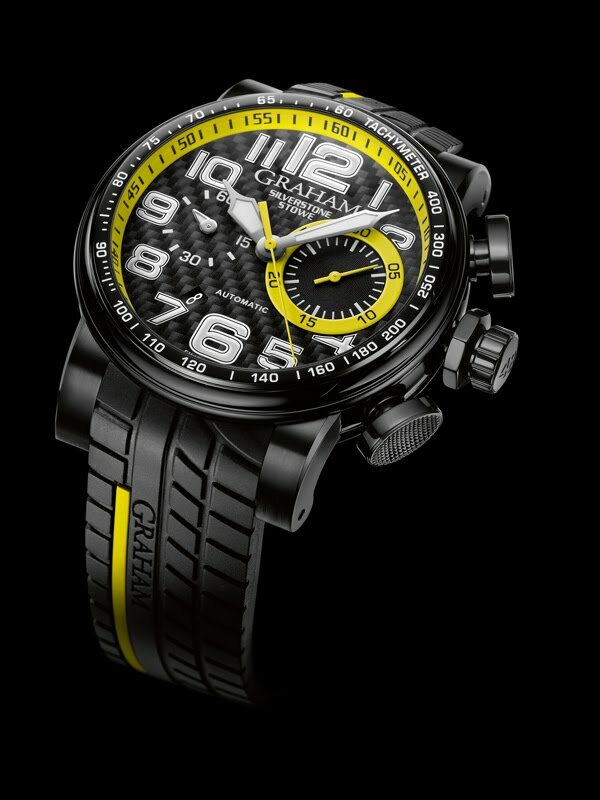 The new high-powered chronograph with GRAHAM black & yellow livery will make all motorsport enthusiasts ecstatic. The impressive watch with its 48 mm steel case with black PVD is a true racing machine. 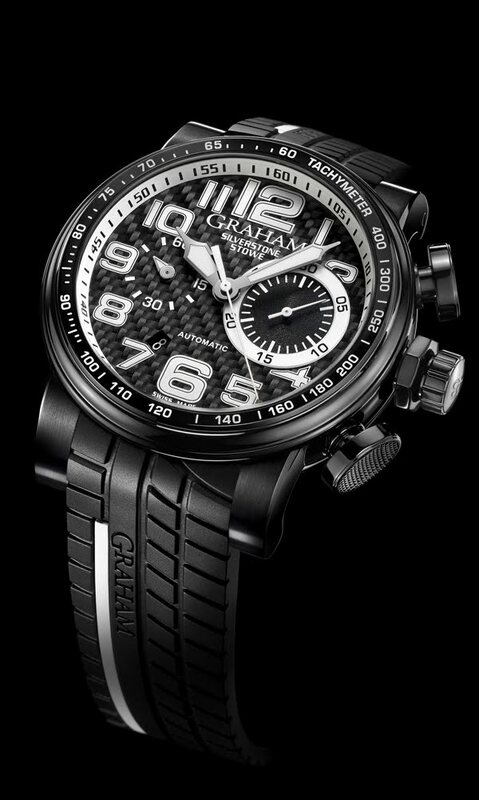 Driven by the ultra-reliable GRAHAM bi-compax column-wheel chronograph movement, with a 48-hour power reserve, this is a watch that can definitely take the heat and knows all about endurance and precision. Every single detail oozes the atmosphere of speed and adrenaline. The watch distinguishes itself by its sporty carbon fibre dial base, enhanced by an external yellow rim with minute scale. The crown is secured by an additional hexagonal bolt, whereas the oval pushers for the chronograph controls bear the same sure grip surface as the pedals of a racing car. To enable the user to measure speeds the black ceramic bezel is equipped with a black rim with a white tachymeter. In addition to showing the hours, minutes and seconds, it sports 30-minute and 60-second chronograph counters with “lemon-ized” hands; the date is at 7 o’clock. Teamed with an integrated black tyre tread rubber strap, featuring an attractive yellow inset, that confirms its undeniable connection with the world of motor sports, the Silverstone Stowe Racing is definitely on the fast track to successful performances. A set of qualities bearing a remarkable resemblance to the spirit that drives Graham in making its masterpieces. 48 mm steel case with black PVD, calibre G1742, automatic bi-compax column-wheel chronograph, 28 jewels, 28’800 A/h (4Hz), Incabloc shock absorber, 48 hours power reserve, domed sapphire crystal with anti-reflective coating on both faces, smoked sapphire case back, integrated black tyre tread rubber strap, featuring an attractive yellow inset. Column-wheel chronograph (second, 30 minutes counter). Date at 7 o'clock.